This was one of my first attempts at doing gigapixel images. This has been stitched together from 50 different shots. On the left bottom corner, you will see Jen. Growing up in Mumbai, I remember seeing stars above me. I remember vividly that I could see the 30 brightest stars in the Northen Hemisphere as I knew them by name and could find them at night. In the 90s, light pollution came and you couldn’t see anymore. Yet, nothing is more awestriking yet relatively easily accessible than a simple moonless, starlit night. At least for now, you can just get away from man-made settlements by maybe a couple of hour to experience that. Last week I went with friends over the Sunrise Point in Mt. Rainier. The visibility forecast for it was very good and I was hoping to capture the Milky Way on my camera using a long exposure. Here are the results. All the light in this picture is coming from the Milky Way and other starlight. There was no moon, and no other man made light leaking through. The dots on the mountain itself are climbers making a summit attempt. Visibility of our surroundings is a key aspect of the experience of a place. 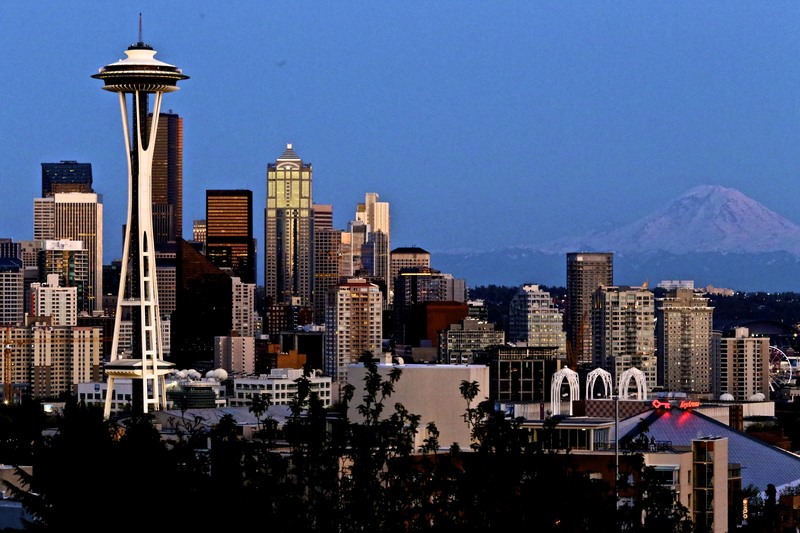 I live in Seattle and one thing everyone here is obsessed with is Mt. Rainier. 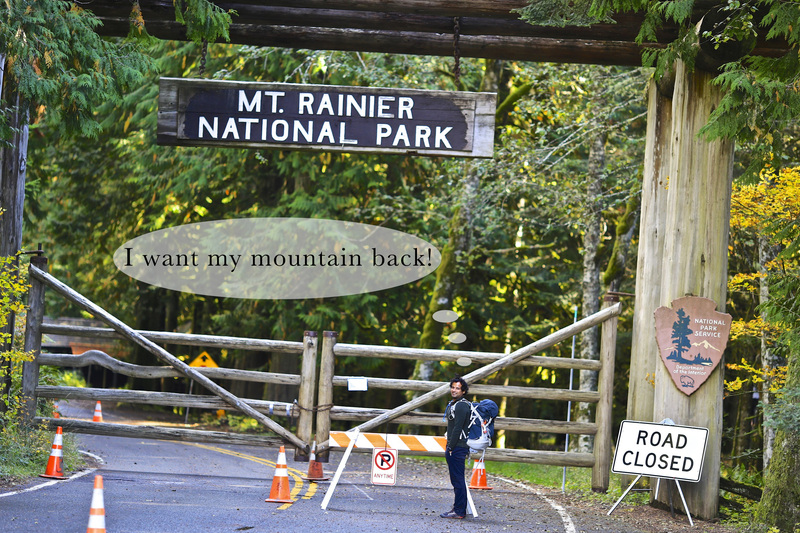 It’s common to hear the phrase “The mountain’s out”. How many times in a year can you see Mt. Rainier from Seattle? Some people claim that it’s a “few days a year”. This time-lapse shows that in 2012 you could see Mt. Rainier a total of minimum 83 times. That translates to once every 4-5 days. Since I am only looking at pictures taken at exactly 3pm every day, the actual number of times you can see the mountain at least once is definitely higher if you consider other times of the day you get a peek at it. I wrote this simple perl script to grab the images from the website and then actually used iMovie to put them together and manually added the counter. We hiked up to Camp Muir yesterday which is at an elevation of 10,080ft. Starting at Paradise it’s a 4,700 ft climb that happens over 5.5 miles. 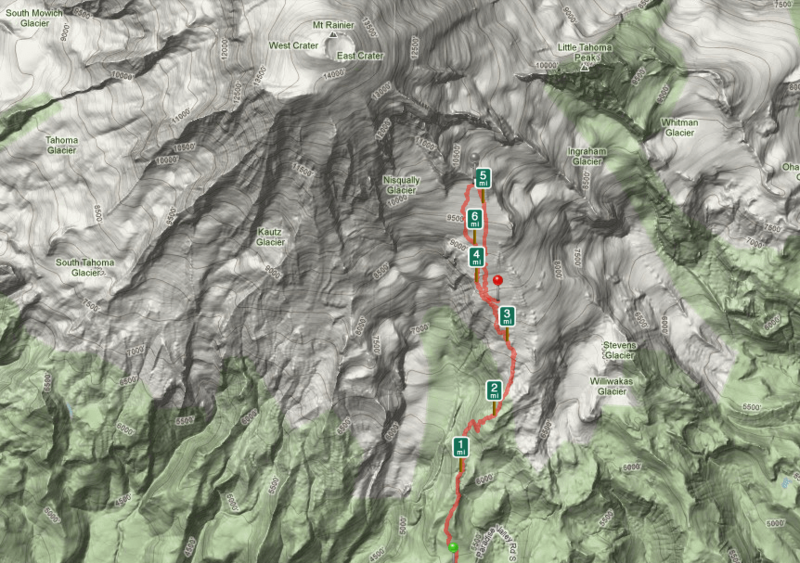 The last 2-3 miles is just a vast snow-field and traversing up that is a chore. Good boots help but we use 5 finger shoes which don’t do too well on the snow. 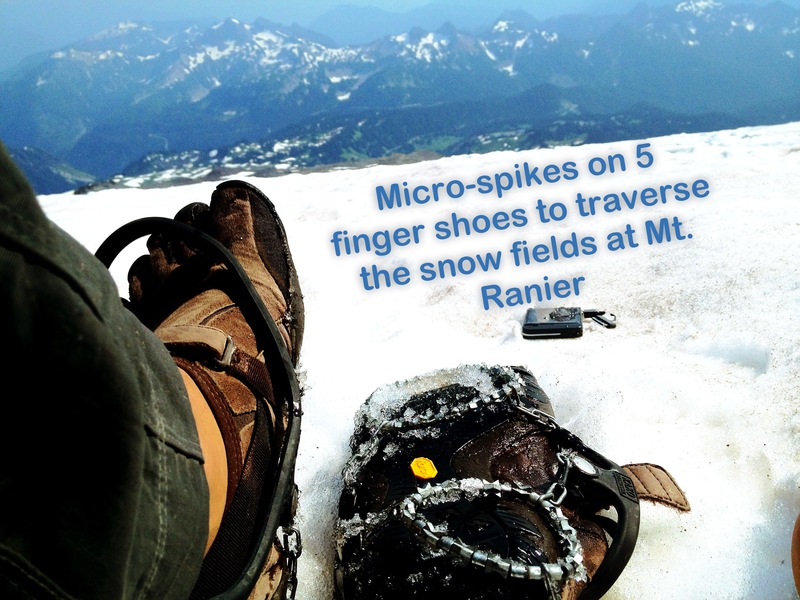 Solution: we used micro-spikes and attached them to the 5 finger shoes and they work really well! Except, the 5 finger shoes don’t have much insulation or water protection and the toes start getting cold 🙁 Make sure you wear socks and have more at hand in case they get wet.